The first-ever year-long mission to the International Space Station will launch in 2015 and feature an American-Russian crew, NASA revealed today (Oct. 5). Two astronauts — one Russian and one American — will launch together in spring 2015 on an experimental endurance mission that will last twice as long as current stays aboard the orbiting lab. The main goal is to gather data that will help lay the groundwork for manned flights to destinations in deep space, officials said. 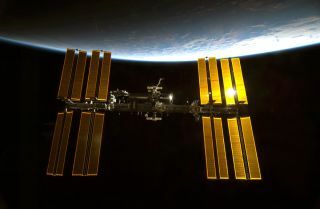 "In order for us to eventually move beyond low-Earth orbit, we need to better understand how humans adapt to long-term spaceflight," NASA's Michael Suffredini, International Space Station program manager, said in a statement. "The space station serves as a vital scientific resource for teaching us those lessons, and this year-long expedition aboard the complex will help us move closer to those journeys." Launching two astronauts means that one seat on the mission's three-person Soyuz spacecraft may be available for another crewmember. On Oct. 10, British singer Sarah Brightman will make a "groundbreaking announcement" about space travel, and some observers speculate that she — or somebody else — may be taking the Soyuz' third seat as a space tourist. During the 12 years that people have lived continuously aboard the space station, scientists have learned a lot about how microgravity affects the human body. They've documented significant effects, for example, on bone density, muscle mass, strength and vision. But that information has been based on orbital stays that lasted a maximum of six months. Studying astronauts on a year-long mission should yield even greater insights into crew health and performance, researchers said. "We have gained new knowledge about the effects of spaceflight on the human body from the scientific research conducted on the space station, and it is the perfect time to test a one-year expedition aboard the orbital laboratory," said Julie Robinson, NASA's program scientist for the International Space Station. "What we will gain from this expedition will influence the way we structure our human research plans in the future." NASA has a keen interest in learning how the human body holds up for long stretches in space, for the agency is currently working to send astronauts to a near-Earth asteroid by 2025 and Mars by the mid-2030s. A manned roundtrip journey to Mars could take around two years, according to some mission concepts. Neither NASA nor the Russian Federal Space Agency, which is known as Roscosmos, has revealed who the two astronauts will be. A few months ago, however, Russia's Interfax news agency reported that the NASA crewmember could be Peggy Whitson, who recently stepped down as the agency's chief astronaut to rejoin its active spaceflying ranks. While no astronaut has yet stayed aboard the International Space Station for 12 continuous months, such a long stay in orbit is not unprecedented. Cosmonaut Valery Polyakov lived aboard Russia's Mir space station from January 1994 until March 1995, spending 438 consecutive days off the planet.